Choose a unique card to say Happy Birthday! Looking for a special Birthday card, then look no further. Choose one of our new range of handmade Birthday cards based on our unpublished tropical birds and British birds card collections. 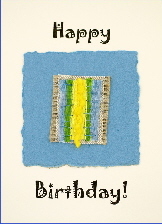 Each card has a brilliant design in silk, wool or handmade paper in bright natural dyed colours and Happy Birthday greetings printed on the cover. The inside of the card is left blank for your own message. 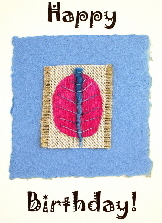 Click on one of the handmade Birthday card photos to buy on the Tropical Birthday Cards website. The birthday card designs are based on our tropical birds cards collection. 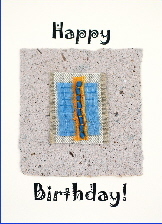 Each card has a brilliant design in silk, wool or handmade paper in bright natural dyed colours and a Happy Birthday greeting printed on the cover. The inside of the card is left blank for your own message. Please note that our handmade birthday cards are now hosted on our card website, Tropical Birthday Cards, and the links will take you there.